Speakers are requested to bring their presentation on a USB in .pdf format and hand it to the venue technician based in speaker preview room at the Royal Geographical Society. To optimise compatibility, particularly for the inclusion of multimedia components, speakers should include the original files so that it can be re-embedded if necessary. Direct connection of personal laptops (with set up in the break prior to the corresponding session) is an acceptable, but not preferred alternative, and must be agreed with the stage technician in advance. Mac users should ensure that they bring the correct connection cable (VGA) with them. The electrical current in the UK is 230v AC and 3 pin plug sockets. If you need an adapter, please bring one with you. Adaptors can be purchased from the airport. The lecture theatre is reasonably large, so speakers should use a minimum 16-point font size in PowerPoint slides to ensure legibility. Presenters are asked to prepare their talks to match the allocated times which will be enforced by the session chairs. Posters will be on display in the conference venue (Royal Geographical Society) with four dedicated poster sessions as scheduled in the programme. During poster sessions, presenting authors are asked to stand close to their boards to answer questions and facilitate discussions on their work. Posters must be no larger than A0 in size (84.1 x 118.9 cm / 33.1 x 46.8 inches), in a portrait format. If your poster does not fit within these dimensions, we cannot guarantee it will be displayed. Fixing material will be supplied. 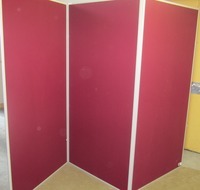 Posters boards will be positioned as shown in the image to the right. Please note that there are no onsite facilities for printing posters, a local print shop (Prontaprint,11 Old Brompton Road,South Kensington, London, SW7 3HZ) can print posters, ideally from files sent in advance for collection. Please email info@southken.prontaprint.com for further information. To ensure that poster presenters can attend all conference sessions, the conference Scientific Secretaries will support the onsite logistics of the poster sessions and will manage the mounting of posters on and off the poster boards. Posters will be on display during the relevant poster session and throughout the following day.